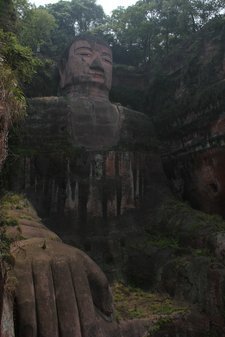 We dropped off our paperwork and passports at the PSB office in Leshan in the morning with promises from the staff that everything would be ready by the afternoon and took a taxi to see the Buddha. The waiting area looked just like any other theme-park-like set-up in every other country. There were bus-loads of Chinese tourists but everything seemed very normal – and then it wasn’t. We turned onto the narrow path down the side of the Buddha and chaos reigned. The path is wide enough for maybe three people. There were five and six people squished across and people pushing from behind to get to see the Buddha or take photos. The careful way that we’d been lined up was a complete sham. No-one was metering the number of people on the path. The official was just waving everyone through creating a monster crush on a dangerous cliff-side path. I was getting angrier and angrier. CAM was just freaking out at being in such close proximity to so many people. There was an older lady behind us who’d obviously been separated from her tour guide and she yelled out constantly in ear-splitting tones. She was probably just saying “Wait Up! Wait Up!” but it was a god-awful racket and since she was pushing to get ahead she was practically yelling in my ear. Poor BigB was trying not to get crushed. This was our first real experience with a popular Chinese tourist site and it wasn’t very pleasant. At 4pm we returned to the PSB office. Passports and visas were ready. It was all so very civilized and efficient and downright pleasant. Such a funny day: a visit to a “holy” site was stressful, the experience of interacting with the might of the Chinese state which I had thought would be stressful was calm and normal. This traveling thing, it keeps you on your toes.